I'm told Marvel Studios is in final negotiations for Buffy the Vampire Slayer series architect Joss Whedon to direct Marvel Studios' The Avengers. That's the fast-tracked film that would amount to an all-star team of Marvel superheros, including Iron Man (Robert Downey Jr.), Captain America (Chris Evans), Thor (Chris Hemsworth), as well as SHIELD leader Nick Fury (Samuel L. Jackson). Other signature superheros will likely be involved, but I've listed the actors in active superhero duty. 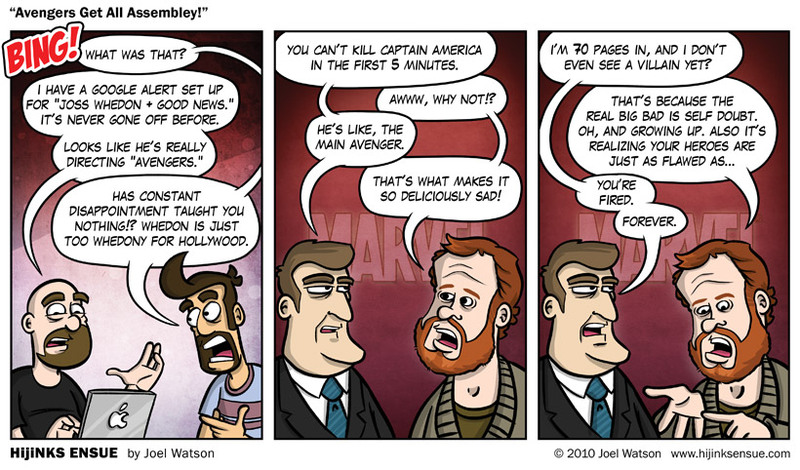 Whedon has been rumored for this job for awhile, and is high on the fanboy wish-list. He's an interesting choice: despite his writing/producing TV series resume, his lone feature directing effort, Serenity, was not a hit. After Iron Man 2, Marvel has three pictures left on a distribution deal with Paramount before it moves to Disney, and the studio has been churning them out. Iron Man 2 gets released in May, Captain America will begin shooting this summer in Europe, Thor is in production, and Marvel Studios just set Pete Sollett to direct Runaways, based on the comic book series created by Lost writer Brian K. Vaughan. Whedon has written installments of the latter, so he knows how to make those superheros fly. Marvel has considered all of the individual superhero movies to be an intro to The Avengers, so the wanna-see on this one will be huge. The film will be released in the first weekend of May, 2012. Once I'm done rewatching Mad Men on DVD, I'm going to finally watch Buffy the Vampire Slayer and then Firefly/Serenity. I loved Serenity even without having seen the short lived series; this announcement comes as a surprise but I appreciate Whedon as a guy trying to work and making a living. Edited by Wally Q, 09 May 2012 - 07:51 PM. How about that story, fellas? Ultimately and ideally, if the actors buy in to what Whedon's selling, it could be one of the best performed superheroes movie ever. Whether the film is any good or not, guaranteed that all real-life 'comic-book guys' will be deliriously happy with this news. To be honest, even though I am absolutely aware of Whedon's geek cred and ability as a story teller, I never would have pegged Whedon to helm something like this. It just seems so grand in scale, corporate and expensive. I don't mean that as a slam either. In a way I think I like that it surprised me. I think Whedon is a decent writer-- loved Firefly and his run on X-Men, but I am in the minority that thinks Buffy is vastly over-rated, Dollhouse was terrible and while he can run a TV show, we've only seen him direct one film-- Serenity. Sereity was decent, but it wasn't mind-blowing directorially. I guess if Whedon is just directing Zak Penn's script, with the Marvel brain trust (which he is a honorary member of already) backing him up, this could be cool. But if he wants to go in there and do a rewrite and it becomes a Whedon joint start to finish, I don't know if it would be that great. My initial reaction is,"Cool! Joss Whedon is doing a superhero flick!". Then again, as I recall, I once said, "Cool! J. J. Abrams is doing a monster flick!". Ya know whats amazing is that essentially Ive never seen anything Whedon has done? I mean I saw Toy Story,but other than that. I never watched Buffy or Angel or Firefly. I never saw Serenity. Looking at his wikipedia page even for the most part stuff he did that he wasnt credited for I havent seen, other than X-Men. Yeah, Cloverfield gets a lot of flack but it was a really great movie. A couple episodes,but not really. I actually think Joss Whedon is a natural choice. All one needs to do is look at Astonishing X-Men and you'll see that handling an ensemble of superheroes is perfect for him. If he is, indeed, directing Avengers, I can rest easy knowing it's in good hands. Honestly, why not Whedon? Hmm, I wonder if he can find a way to work in Eliza Dushku...? Hopefully it isn't as boring as Serenity. iLOLed a bit at the punchline to that comic. I smiled. That puts it one up on Penny Arcade. If they play loose with the roster, Chiwetel Ejiofor = Black Panther. I wasn't a big fan of Norton's portrayal and I'd love to see Bana come back for the role. I prefer Norton. I hope they bring him in for the film.